I’m a bit of a ‘last minute Lucy’. Tonight when I was prepping for my clinic kids that I see after school weekly I whipped up some super cute ‘awards’. Today was the last day I would see them before we switch to the summer schedule where I run groups and evaluations instead of individual sessions. 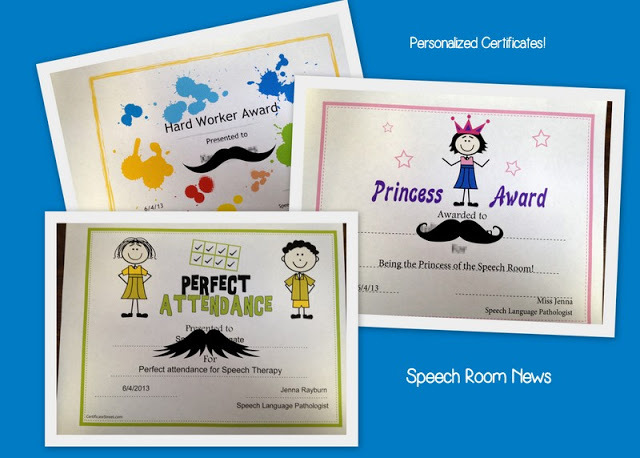 My office manager mentioned certificates and I found an amazing website to print really cute and unique awards. My preschoolers loved them! I just printed these quick and easy certificates from Certificate Street. ((The mustaches were added to cover their names! ))The Princess Award was the favorite and my 4 year old loved it! When you download each certificate, just use the free one. It says the free version will have a watermark, but it’s just their company name in the bottom left hand corner. How do you recognize your kiddos at the end of the year? My kids would love this! And I love the fact they’re free! Thanks! Thanks for sharing!! That is so cool!! I use lakeshorelearning.com for my free certificates. Just click on “resources” and then “award maker” to find some cute awards for all kinds of things.